I have found the Confessions to be very informative and to the point. 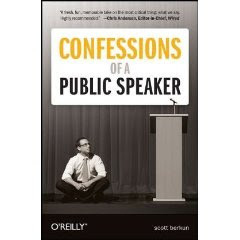 In this book, Scott Berkun is somehow doing a complicated exercise : sharing his own experience of public speaking requires something that can be compared, somehow, to a kind of "mental strip tease". Most of the book is build around some episodes of Scott Berkun's life. Sharing very personal story about his life could have produced a boring and uninteresting book (aka me, myself and I) but this is not the case. Because the book is very grounded, the experiences that are shared are always interesting and completely integrated into the story. Also, the book includes a lot of experiences from other famous (or not!) public speakers in order to illustrate certain points. Several key points are covered in a nice chapter per chapter approach. Each of the point somehow resonate with my own (limited) experience as a public speaker and because of this connexion, It is very easy to understand and benefit from the book. Occidental people in general and north american in particular tend to confuse theoretical knowledge and practical experience : after reading a book or two and after having watched a video or two, we tend to become very quickly a martial art master or a buddhist Yogi. Scott Berkun is very careful to destroy this myth in every bit of advice that he shares and I really think that this is a key point here. No silver bullet here : work work and work again. I have found a lot of very interesting experience, hints and advice : how to repeat, practical advices on how to be yourself (somehow!) on stage, test the room where you will perform, what to do if ... the room is empty, you forgot your slides, the crowd is angry, etc. All in all a very honest and practical book that will benefit anyone that has to publicly speak. In my mind and in no particular order : scientists/students that have to present they research (especially M.Sc., Ph.D. : practice your show ! ), teachers of any level (how to engage your students), managers of any level (how to engage your employee), salesman that present during show/conventions/conferences (how to engage your prospects/future customers).